Halloween photos, midterm election posts, and 30-day gratitude challenge posts. By now, the Halloween posts are probably waning. The election posts--or political posts in general--don’t show any signs of stopping though. But, at least right now, there are more celebratory posts than angry rants, right? And if you haven’t seen any gratitude posts on your feed, then you’re clearly not following me on Instagram or Facebook, because I’ve been posting a video each day sharing one thing I’m grateful for. So far, I’m really loving this challenge. And I’m seeing others post things they’re grateful for too, which is a lot of fun. And actually, that’s right in line with what I want to talk to you about today: How and why you should start a gratitude practice. And for all the different ways you can start practicing gratitude in your day-to-day, they’re all really simple. This week’s video talks about some of the health benefits of practicing gratitude and several simple ways you can incorporate it into your daily life. I suggest you watch the video (or read the transcript) below, check out the resources and helpful links, and then pick one thing to try this week. So, let’s get started! And leave a note in the comments or shoot me a message letting me know how you plan to practice gratitude this week! This video previously aired as a Facebook Live. You can follow Happy With Baby on Facebook to catch all their live videos here. Hey, guys. How are you doing today? Happy November first. I can't believe it's November already. Did you have a good Halloween? Definitely we had probably one of my most favorite Halloweens ever with really good friends and our family and it was it was a lot of fun. And I'm kind of feeling tired for it today, so anyways, but I'm here. And I'm a little bit later than I had hope for, but I'm here and I'm excited to be talking about--because it is November 1st and Thanksgiving falls in November obviously here in America and one of the things you start hearing people talk about is gratitude, right. And and this is the time of year I think people tend to be more intentional about it because Thanksgiving is coming up. And so you'll probably start seeing posts and people will do these you know 30-day challenges on being grateful and showing gratitude and so that I'm gonna jump on that bandwagon. I'm gonna be one of those people. And I'm gonna talk about it several times this month. But today, I just want to talk about how there is that, you know, there's scientific evidence that being grateful is good for us, right. It's good--does amazing things to our brains and just there's just a whole host of like the health benefits of it. And I'm not saying like, all you have to do is be grateful and your world is better, like your depression or anxiety, it goes away. I'm not saying that at all. I'm saying adding this to it can definitely help in all the different areas of your life. So some of the ways it can be helpful: it can definitely help improve your sleep which then also helps reduce pain. When we--sometimes at night, I know especially how people tell me like it was hard, you know, to fall asleep and they're worrying about all this stuff and it's like, if you can change the things that you're worrying about to the things that have happened that are good, it can be definitely a good way to kind of switch that and I know sometimes I've even found for myself that if I start thinking and start worrying, I can't fall asleep or whatever, it's like, okay, wait a minute. What are some of the good things that happened today? Or what are some of the good things I need to focus on? And it does definitely help a lot. Another thing is grateful people are more likely to exercise and go outdoors, which we also know being outdoors has tremendous health benefits. There's studies that show that improving--it can help improve your self-esteem. Of course, like right, if you're grateful you feel better about yourself and everything. It promotes empathy and can reduce aggression. Happy--you know, people that are grateful are less aggressive. It improves relationships and reduces stress and can help reduce symptoms like post-traumatic stress disorder, depression or anxiety. 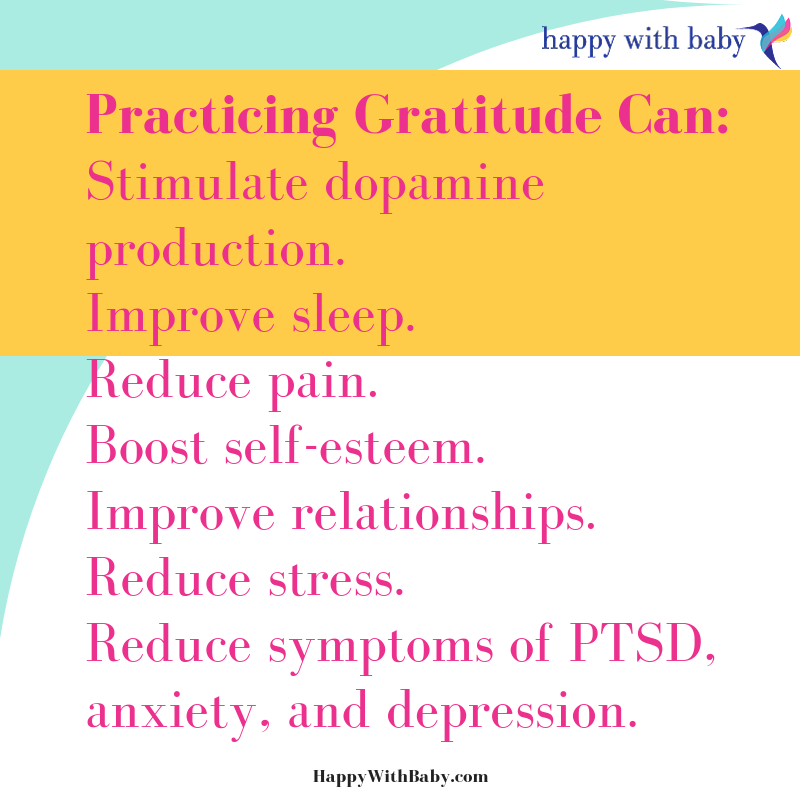 And then practicing gratitude actually helps rewire our brains and stimulates the production of dopamine, which is that like feel-good chemical in our brain that we really need and definitely we need more of that in our lives, right. We could all use more of that. So how can you incorporate more ways to be grateful in your life? One of the things now that my kids are older--like this would be hard to do with an infant, but you could do it with your infant present of course--but on the way to school, I do drive both my kids to school and we'll talk about like what is one hope like, you know, we kind of set our intention for the day. Like, what is your hope to accomplish today? What do you hope to do? And you know maybe my son has a spelling test or some tests and he might say "I hope get a good grade" or "I hope I score a goal during soccer at recess" or whatever it is. And my daughter is in kindergarten so her big one lately is like making new friends. And then we'll talk about like, what are those things, like how are you gonna accomplish that? And and I'll even let them know like I'm working on this project or I've been working on my book here now for years it feels like, but definitely even more so in the last several months. I'll talk about like I really want to, you know, get that chapter finished or really, you know, rework something. So they like know what I'm working on. Or like I have sessions all day, so I really hope you know I can be the best therapist that can be for my clients today. So we'll talk about that and like what are ways how are we going to do these things and then also, you know, then at the end of the day, we'll check in. Like if--I don't always get to pick them up, but if I pick them up, we're talking about what's one great thing or what's one thing good thing? And we've been trying to do that more at dinner too. Sometimes we get away with talking about other random things that I forget to always go back to it, but it seems like when we're driving in the car is a good time to always have great conversations with them because everybody's sitting still enough to listen to me and to each other. Yeah and so other ways you can do this is there's also like five-minute journals. You can write in a journal and that one's a good one cause it like prompts you, asks you specific--these kind of specific questions and it asks you--in the morning, you fill out some questions, and evening, you fill out questions. It really doesn't take that much time, but you could also keep your own journal, like find--you know, there's beautiful ones out there. Pick a great journal and start writing down everyday like things that you're grateful for. And not the same things every day, or yeah, oh I'm grateful for my family--of course I'm always grateful for them, but what is like some other things I can think of to add to that list that are different and trying to--I've been trying to be more intentional about writing different things and not just writing the same thing every single day. So doing things like that and you can keep keep it in a notebook. I had a client that was telling me and how they always their journals just full of all the bad things that happen because when they're really upset, it really helps them to write things out. They're like, "I was looking at it and it's like I never have anything good because I don't think to go back and write those good things." So now it's like, trying to practice like writing down the good things that happen too, to also help them remember when they are having a difficult time, they can go back and be like, no, see, it's not always this bad. There are these really great moments and I do have these great things that I am grateful for and are helpful and wonderful in my life. And sometimes we need those reminders. So that could be another good reason to start that journal. There's even great gratitude apps, which of course there are. There's apps for everything. And I had a friend that was pointing it out where you can even add like pictures or do different things and, you know, it will prompt you with questions kind of that five-minute journal and stuff like that. So I mean, basically you just put in "gratitude" under apps and a bunch of them like pop up and stuff. So you know, you should check that out. Or another great idea is keeping a jar for the year and you can write every day--write down something you're grateful for, and then like at Thanksgiving, for instance, you can like go over and reread them and remind yourself of like all the great things that happened during the year. I think that's actually something I'm gonna try to do with my kids this year, now that they're both writing. I think it could be really fun to go back and look over the ones for the year. Or even if it's just for the month, it would be really awesome too. And then, one of the things I really try to do too is like, if something comes up, is to say it to even my family members when I'm grateful for them, is make a point of saying something to them. Or sometimes in the middle of the day, I'll think of something or on there's something my husband does and I'll try to just text him and be like, "Oh I'm so grateful that you did this" or "I really--I noticed this" and just let him know in those moments and let my kids know in those moments, like I appreciate that you finally put your shoes in the little shoe bin right there. The shoes were on the floor, but now they're actually in the bin that I've been trying to get you to do for months. And I'm like so grateful for that because I think that makes me happy to have that nice space. What are some other things? You know, and I don't know why this like popped into my head, but I was like thinking about this is--and I guess this goes along with gratefulness and so bear with me for a moment because I think it's a long winded way to say it, but like even with my kids, when when I do get upset--because I do get upset, like I'm a human being. We're all human beings. It's like, really try to be intentional and be apologetic and let them know like I'm sorry, like I did get frustrated. I did get upset. And let them know when I've noticed that I haven't done something that is particularly like bringing out the best in myself. And one of the best things about it is that they always are so, you know, pretty responsive to it and acknowledge it. And then I also know and notice how they are--they do the same thing to each other, like I notice them do it to each other and hopefully they do it out in the real world too. Like if something happens and they've learned how to make amends for like moments when they've been upset about something, like if my son like yelled my daughter because she played with his toy and he didn't like that or whatever, and like come back and be like, you know, this "I was upset because you didn't ask" or whatever. But you know, and then they're able to move on and go along it faster. So I'm grateful for like those moments where we've learned how to share our feelings with each other, whether they're good or bad and be able to talk about them later. And it's just, yeah, it's this a grateful moment. So anyways, that's not really with it, but for whatever reason, that just kept popping into my head as I was like talking about this. So this month, we're gonna talk a lot about being grateful and gratitude. And next week, I think I'm gonna talk more about how to break this down. How do we do this? Because I think so often we're like, live in this fast pace, we've got to always be doing something. There's all these things happening, like you know, our kids are pulling us this way, our partners pulling us this way, we've got work, we've got home stuff, there's like how do we slow down in all this and be able to be in these moments and take these times to like sit with our gratitude? So we're going to talk about that, and we're gonna also talk about how to kind of survive the hustle of the holidays, and how, you know, to use these tips to kind of help us with these moments and stuff too. So I hope this is helpful. I would love to know what you do to acknowledge what you're grateful for, how you show your gratitude to others, so feel free to share in the comments. And then I'll also share just a great article that I found helpful when I was doing some research and stuff. And I hope you guys have a great day. I'm grateful for you, if you listened to this, and would be even more grateful if you felt like you wanted to share it. Until next week, you guys, take care. Bye.